We at Vibes feel like we’re in a new relationship this year...with email. 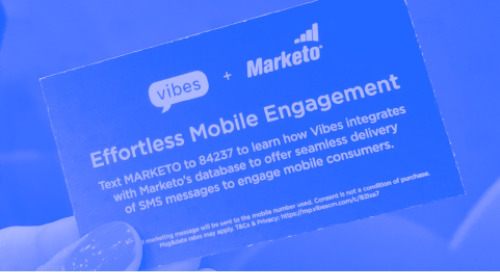 We’ve spent the past few months at events and on our blog talking about the powerful combination that mobile marketing and email provide when it comes to engaging your audience. They flit from one channel to another, and as a marketer, it’s your job to keep up. That’s why multiple touchpoints are so effective, especially when they complement one another the way email and mobile do. The fact that 3 in 5 consumers check their email on their phones means that you have significant opportunity to cross pollinate both your email and your mobile contact databases if you know how to do so effectively. Another reason to combine the two: email open rates average about 20%...while text open rates are at a whopping 98%. Response rates for texts are also much higher. That’s not to say you should abandon email, but it is important to align your messaging with what your audience wants. Mobile enhances what email does by adding another layer of value, such as pushing offers based on geo-location. While you may have one segment of your database already subscribed to your mobile wallet offers, you likely still have a sizeable number of contacts who are only getting your email messages. Why not combine the two? Sending an email with an easy way to save a mobile wallet offer to their phone with just a click or two can boost conversion of your email contacts into mobile contacts. We want to offer you more ways to get our incredible offers, so we invite you to join our mobile wallet program, where you’ll get coupons and promotions you can save to your digital wallet on your phone. Getting started is easy. Click the “Save Now” button below. That’s all it takes! You’ll get notifications of offers on your phone. Just click “save” or “redeem” to take advantage of them. You may want to set up a drip campaign with several pushes to sign up for your mobile wallet offers. Email 1: What is Mobile Wallet and How Can It Benefit Me? Email 3: Have You Put Us In Your Wallet Yet? Remember: Just like with email, you need to make it easy for people to unsubscribe or opt out of any mobile marketing messages as well, especially in light of GDPR. Any time you can offer more value to your customers, they’ll be even more happy to hear from you, regardless of the channel. The good news for you is that the happier they are, the more revenue you will bring in, the better your acquisition rate, and the higher your customer lifetime value. Additionally, the more data you have from your customers, the more robust your customer profile. Connecting via both email and mobile gives you rich data that you can use to shape future marketing campaigns. Having access to individual behaviors and preferences, you can deliver more personalized, relevant and timely content, which drives higher conversion rates. With so many benefits, why wouldn’t you be harnessing the power of email + mobile?